I spun up three 100 gram Frazzlebatts. I plyed them together and made two big balls of 3 ply yarn. Sparkly, purple and red and blue yarn. Thick yarn that wanted to be boot socks. I experimented with needle sizes. I experimented with toe shapes. I experimented with patterns and leg shaping and in the end, I made knee high socks. Then I thought, I should write that pattern down so that next time I want to make socks out of handspun, I don’t have to do so much experimenting. And I should share it, in case other people want to make socks out of their handspun yarn too – a recipe for figuring out how to make socks with a bit of trial and not too much error. So you got a lovely batt and spun it up. Maybe you got two or three. You have this pile of lovely yarn and it really wants to be something awesome, but … what does it want to be? Perhaps what it wants to be is a pair of socks. Well, sure, you say, but did I make “sock yarn”? What if my yarn is thicker than the usual stuff you get for socks? What if I’m not sure I have enough for socks? Will I run out partway through the second sock? How do I know how many stitches to cast on when I’m using non-standard yarn? 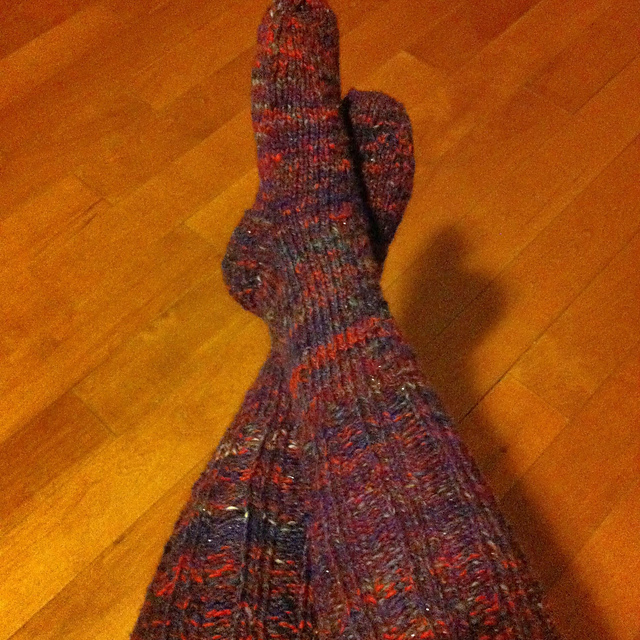 Fear not, brave knitter, Frazzlehead’s Handspun Sock Recipe addresses all these problems. Love those Alberta Winter socks... great design and color.. Enjoy!